Deforestation is an issue that is completely ruining our planet. With palm oil plantations currently covering over 27 million hectares of the Earth’s surface and rapidly expanding, something needs to give. Deforestation in the world today is the primary threat to the orangutan. For those who do not know, the orangutan is a species of great ape that is quite intelligent and important. Within the next two decades, they will not be present in the wild if things continue on as they have been. These great apes live in trees and rarely ever touch the ground so the fact that their trees are being torn down is devastating. I recently came across a video that shows just how damning deforestation is. While you hear people say ‘a picture is worth a thousand words,’ this video says more than I could ever imagine. About six thousand orangutans are killed each year due to deforestation. While this footage is from 2013 things like this are still happening. In this video, you will see an orangutan trying to defend its home from being shredded to bits. While its efforts are not doing much your heart will break seeing it try. While this orangutan ended up being rescued from the situation, not all are lucky. Sometimes they are driven out of their areas and near homes where locals end up dealing with ‘conflicts.’ If you use products with palm oil, after taking a look at this video you might be ready to think twice about them. Considering that palm oil is the driving force behind all of this we need to work together to become more aware. 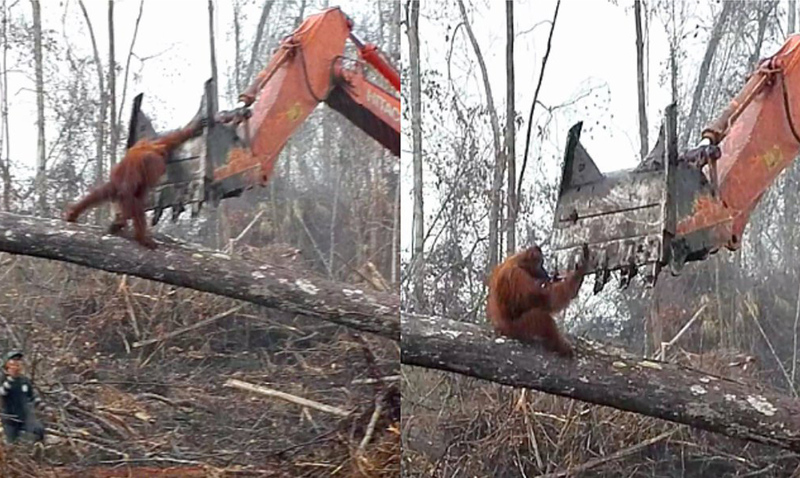 Please watch this orangutan trying to save his or her home and then let us know how you feel. Did he or she deserve this? Should these marvelous creatures be forced to go without shelter for our own greed?